If you feel that problem of slow startup is limited to Windows PC then you are mistaken. With passage of time, Mac may also start to take a lot of time to start. So, if you are having the thoughts to buy a new Mac because your current Mac takes quite a while to start then just go through the article. You never know, may be a few minutes spent on this article will help save you many dollars. 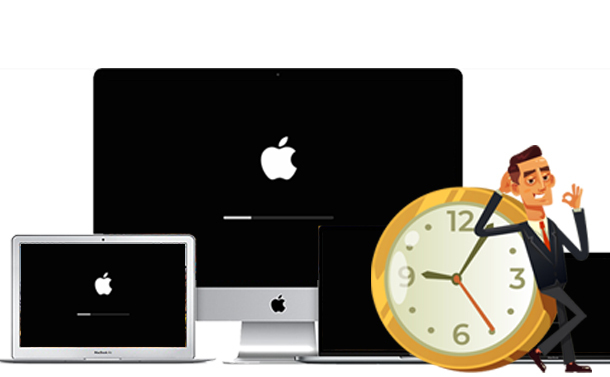 Here, we have tried to sum up 5 tips to minimize the startup time of your Mac. This is the first step that will help you boot your Mac faster. In the Login Items, look for the items that are unnecessarily lying there and remove them. Once you remove the unneeded login items they will not load at the start of Mac resulting in faster boot up of your Mac. Click on the Apple icon located at the top-left corner of your Mac screen. Now, from the drop-down menu select System Preference. In the new window that opens click on Users & Groups. Now select the user account for which you want to remove Login items. Now click on Login Items tab. From the populated list, check mark the items that you do not want to start with the start of your mac. Click on minus button to remove. Once done, close the window. Your setting will be automatically set at the next startup. Open Disk Utility on your Mac. Now from the left panel select the hard disk. Since we are not sure that the hard disk contains errors or not, therefore, first click on Verify Disk. Now the disk is checked for the errors and will show a report after completion. If report shows the errors on the hard disk then click on Repair Disk to fix them all. It is always advisable that you occasionally run this tool and fix all the errors if any occur. Many Mac users find this option useful as it reopens all the previously opened windows with the start of Mac. However, this results in slowing the start of Mac. Since you want to minimize the start time of Mac you should consider disabling this option. All you need to do is uncheck the option “Reopen windows when logging back in” from the prompt that appears system shut down. A hard disk filled to its maximum capacity also slows down the startup process of Mac. Therefore, you should keep on checking for the unnecessary files and programs you have stored on your Mac. You may also consider backing up your files to the cloud that are infrequent in use. This not only helps you in getting back space on your hard drive but also help in minimizing the startup time of your Mac. When Apple provides all the updates and releases them free of cost then there is no reason you say no to them. Moreover, all the latest updates contain the security fixes for the previous bugs if any exist. Also, with each update Apple focuses on making the performance of your Mac smoother. So, a Mac running with latest version of operating system surely takes lesser time to boot when compared to a Mac running with an older version of operating system. Solid State Drive has the capability to perform read and operation faster as compared to conventional hard drives. Though they are costlier than conventional hard drives but they drastically speed up the overall response time of your Mac, resulting in minimizing the startup time of Mac.